Labelled G. Butler London and Dublin. Probably built by one of the bigger makers of the time for resale in the G. Butler store, looks very much like a Larson Brothers guitar. Rosewood laminate over possibly Mahogany on the back and sides. 11 3/4″ at the Lower Bout. 8 1/2″ at the Upper Bout. Has 2 repaired cracks on the back and some scratches. 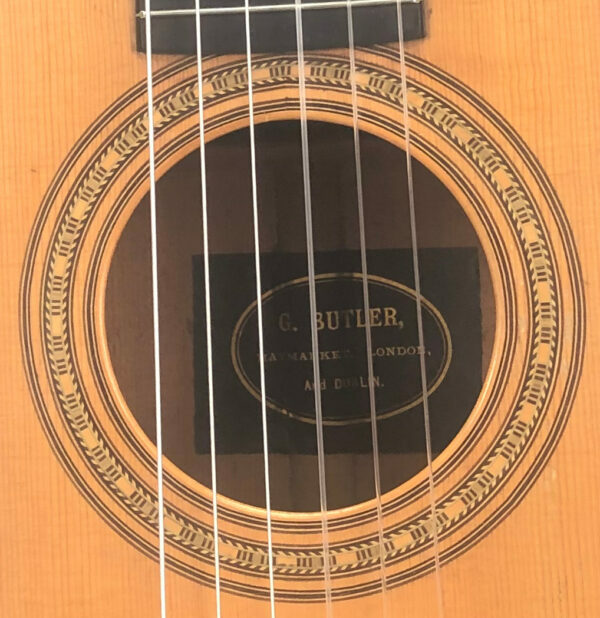 I have it strung with nylon strings but it could probably take silk and steel strings, anything heavier than that would be pushing it for a guitar this old and delicate. Comes with the coffin case shown. Negra flamenco guitar with engelmann spruce top, cocobolo back and sides, ebony fingerboard.